Part of the Eighth Stony Brook University Human Evolution Series, the public symposium, “50 Years of Zinjanthropus: How One Discovery Changed the Face of Paleoanthropology,” examined the development of scientific prehistory research in East Africa that resulted from the discovery of the Zinjanthropus fossil by Mary Leakey in 1959, and the subsequent dating of Olduvai Gorge in 1961. This led to field research programs in Ethiopia and Kenya, the findings of which now dominate discussions of human evolution. The symposium featured a diverse group of scientists from around the world. Richard Leakey, Stony Brook University professor and Chair of the Turkana Basin Institute, opened the event and provided an overview of the state of paleoanthropology at the time the landmark fossil skull was discovered by his mother. Yoel Rak, Tel Aviv University, detailed the various morphological features of the Zinjanthropus genus, known alternatively as Paranthropus and generically referred to as the “robust australopithecines.” Frank Brown, University of Utah, spoke of his early work in the Omo delta in Ethiopia, and on the dating of Olduvai Gorge and ensuing revelation of the antiquity of the “Zinj” fossil, which, at 1.75 million years, proved stunning to the scientific community at the time. Meave Leakey, also of Stony Brook University and the Turkana Basin Institute, provided a context for how this remarkable discovery made possible the decades of research she and Richard enjoyed in the Turkana Basin, and which she continues to the present. Marta Lahr, of Cambridge University, concluded with her presentation of the current state of paleontological research and what possibilities the future of the field may hold. 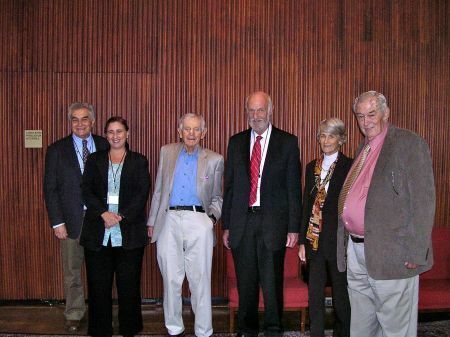 The symposium was followed by a reception on The Rockefeller University campus.